The people do indeed look at Washington and know that this city is ‘badly’ broken, Senator Kerry. The public confidence in our Congress has been declining drastically. Recent poll results highlight how the American people’s trust in their Congress has hit rock bottom. A survey of progressive blogs easily confirms the rage rightfully directed at our Congress for abdicating its role of oversight and accountability. Activists scream about promised hearings that never took place – without explanation. They express outrage when investigations are dropped without any justification. And they genuinely wonder out loud why, especially after they helped secure a major victory for the Democrats. The same Democrats who had for years pointed fingers at their big bad Republican majority colleagues as the main impediment preventing them from fulfilling what was expected of them. The recent stunning but not unexpected revelations regarding Jane Harman (D-CA) by the Congressional Quarterly provide us with a little glimpse into one of the main reasons behind the steady decline in the integrity of Congress. But the story is almost dead – ready to bite the dust, thanks to our mainstream media’s insistence on burying ‘real’ issues or stories that delve deep into the causes of our nation’s continuous downward slide. In this particular case, the ‘thank you’ should also be extended to certain blogosphere propagandists who, blinded by their partisanship, myopic in their assessments, and ignorant in their knowledge of the inner workings of our late Congress and intelligence agencies, helped in the post-burial cremation of this case. I was not aware that during the publication of the Hastert story in Vanity Fair, Jane Harman’s AIPAC case was already brewing in the background. Moreover, one of the very few people in Congress who was notified about Harman was none other than Hastert — the man himself. 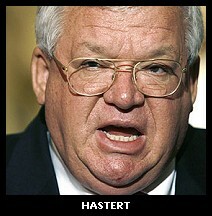 The same Hastert, who in addition to being one of several high-ranking officials targeted by FBI counterintelligence and counterespionage investigations, was also known to be directly involved in several other high profile scandals: from his intimate involvement in the Abramoff scandal, to the Rep. William Jefferson scandal; from his ‘Land Deal’ scandal – where he cashed in millions off his position while “serving”, to the 2006 House Page scandal. How does it work? How do these people escape the consequences of accountability? Are we talking about the possible use of blackmail by the Executive Branch against Congressional representatives, as if the days of J. Edgar Hoover were never over? Cases such as NSA illegal eavesdropping come to mind, when Congressional members were briefed long before it became public, yet none took any action or even uttered a word; members of both parties. Or is it more likely to be a case of secondhand blackmail, where members of Congress watch out for each other? Or, is it a combination of the above? Regardless, we see this ‘all for one, one for all’ kind of solidarity in Congress when it comes to criminal conduct and scandals such as those of Hastert and Harman. 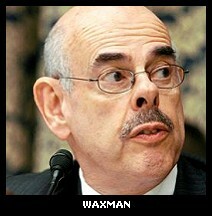 In 2004 and 2005 I had several meetings with Rep. Henry Waxman’s (D-CA) investigative and legal staff. Two of these meetings took place inside a high-security SCIF, where details and classified information pertaining to my case and those involved could be discussed. I was told, and at the time I believed it to be the case, that the Republican majority was preventing further action – such as holding a public hearing on my whistleblower revelations. Once the Democrats took over in 2006, that barrier was removed, or so I thought. What was discussed during that meeting? The facts regarding the FBI’s pursuit of Hastert, and certain other representatives, were bound to come out in any Congressional hearing into my case. 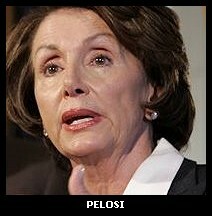 Now we know that Hastert and Pelosi were both informed of Harman’s role in a related case involving counterespionage investigation of AIPAC. Is it possible that Pelosi asked Waxman to lay off my case in order to protect a few of their own in an equally scandalous case? Was there a deal made between the Democratic and Republican leaders in the House to keep this and other related scandals hushed? Will we ever know the answer to these questions? Most likely not, considering the current state of our mainstream media. Back to the enablers: How can we explain the continued blackout by the mainstream media, and/or, the logic-free defenses of the Harmans and Hasterts alike by the apologist spinners — some of whom pass as the ‘alternative’ media? Some are committing what they rightfully accused the previous administration and their pawns of doing: cherry picking the facts, then, spin, spin, and spin until the real issue becomes blurry and unrecognizable. The conspiracy angle aimed at the timing; Porter Goss’ possible beef with Jane Harman; accusing the truth divulgers, CQ sources, of being ‘conspirators’ with ulterior motives; portraying Harman as an outspoken vigilante on torture. And if those sound too lame to swallow, they throw in a few evil names from the foggy past of Dusty the Foggo man! If the issue and its implications weren’t so serious, these spins of reality would certainly make a Pulitzer-worthy satire. Let’s take the issue of timing. First of all, the story was reported, albeit not comprehensively, by TIME magazine years ago. It took a tenacious journalist, more importantly a journalist that could have been trusted by the Intel sources to give it real coverage. It is also possible that the sources who leaked in the Harman case got fed up and disillusioned by the absence of a real investigation and decided to ‘really’ talk. After all, the AIPAC espionage case was dropped by the Justice Department’s prosecutors within two weeks of the Harman revelations. But, let’s not forget, the misuse of incriminating information, for the purpose of blackmail, does not turn the practitioner of the wrongful deed into a victim, nor does it make the wrongful criminal deed less wrong. Instead of spinning the story, taking away attention from the facts in hand, and making Harman a victim, we must focus on this case, on Harman, as an example of a very serious disease that has infected our Congress for far too long. Those who have been entrusted with the oversight and accountability of our government cannot do so if they are vulnerable to such blackmail from the very same people they are overseeing…Period. Those who have been elected to represent the people and their interests cannot pursue their own greed and ambitions by engaging in criminal or unethical activities against the interests of the same people they’ve sworn to represent, and then be given a pass. As for far-reaching ties such as Harman’s stand on torture, or a specific beef with former CIA Director Porter Goss, or wild shots from the hip in bringing up mafia-like characters such as Dusty Foggo; please don’t make us laugh! 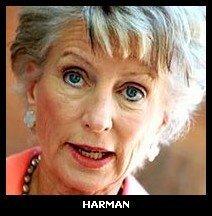 Are we talking about the same Hawkish Pro-Secrecy Jane Harman here?! Harman’s staunch support of NSA Wiretapping of Americans, the FISA Amendment of 2008, the Patriot ACT, the War on Iraq, and many other activities on the Civil Liberties’ No-No list, is widely recognized by almost everyone, apparently, but the authors of the recent apologist spin. And, let’s not forget to add her own long-term cozy relationship with AIPAC, and the large donations she’s received from various other AIPAC-related pro-Israeli PACs. To these certain ‘wannabe’ journalists, driven by far from pure agenda(s), shame on you; as for honor-worthy vigilant activists out there: watch out for these impostors with their newly gained popularity among those tainted in Washington, and take a hard look at whose agendas they are serving as a mouthpiece for. Despite a certain degree of exposure, cases such as Harman’s and Hastert’s, involving corruption of public officials, seem to meet the same dead-end. Criminal conduct, by powerful foreign entities, against our national interest, is given a pass, as was recently proven by the abandonment of the AIPAC spy case. The absence of real investigative journalism and the pattern of blackout by our mainstream media seem now to have been almost universally accepted as a fact of life. Therefore, you may want to ask, why in the world am I writing this piece? Because more and more people — although not nearly enough — are coming to the realization that our system is rotten at it’s core; that in many cases we have been trying to deal with the symptoms rather than the cause. I, like many others, believed that changing the Congressional majority in 2006 was going to bring about some of the needed changes; the pursuit of accountability being one. We were proven wrong. In 2008, many genuinely bought in to the promise of change, and thus far, they’ve been let down. These experiences are disheartening, surely, but they are also eye-opening. I do see many vigilant activists who continue the fight. As long as that’s the case, there is hope. More people realize that real change will require not replacing one or two or three, but many more. More people are coming to understand that the road to achieving government of the people passes through a Congress, but not the one currently occupied by the many crusty charlatans who represent only self-interest — achieved by representing the interests of the few, rather than the majority of the people of this nation. And so I write. Sibel Edmonds is a former FBI translator and noted whistleblower who has been under a years-long “gag order”, prohibiting her from discussing many details of her allegations of corruption and espionage gleaned during her time at the FBI, due to the continuing “States Secrets privilege” assertions by the Executive Branch. Her own story has been partially documented over the last several years in several different media outlets, including a lead story on CBS’ 60 Minutes, a detailed feature in Vanity Fair and, over the years, in a number of exclusive articles here at The BRAD BLOG. She is the Founder and President of the National Security Whistleblowers Coalition.